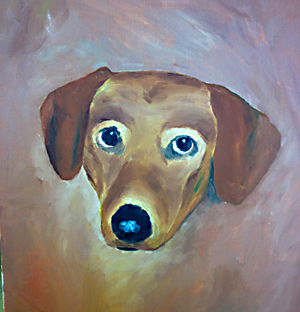 This is a 16” x 20” acrylic painting on canvas of my childhood pet “Liebchen”. He was a dachshund, so a German name seemed appropriate (I also had a pet parakeet named Perry, so you can see my approach as a kid to naming things was pretty literal). I commissioned my high school classmate Paul Johnson (who is now a minister in Winnipeg – very cool!) to paint this and gave him a Kodachrome slide for reference. Paul was paid $12 according to his handwriting on the back of the painting. I really like the floating head esthetic and how those sad eyes seem to follow you around. Next PostWile E. Coyote faucet? What?